At first glance, Hack ‘n’ Slash looks incredibly familiar. You play an elf with a green tunic and a cartoon quiff. 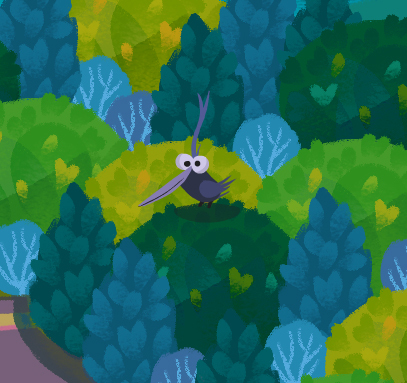 There’s an evil wizard, a small floating companion, and a colourful but corrupt land of forests and dungeons. It looks like Zelda, but appearances can be deceiving. The sword you begin your adventure with immediately breaks, revealing an alternate purpose for an icon of the action genre. Your weapon becomes a USB input device that allows you to manipulate and interact with the world’s hidden code. Rather than hacking away at enemies, you’re hacking in to engineer your way to victory. 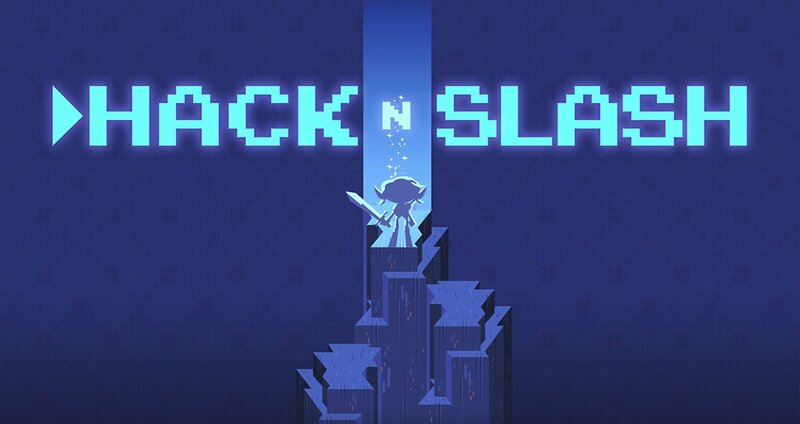 Despite unfamiliar mechanics, Hack ‘n’ Slash received the most votes in Double Fine’s 2012 “Amnesia Fortnight” — an event where the public chooses from a selection of in-house game pitches. The story, which embodies much of Double Fine’s usual charm and wit, is a simple affair, but one that seeks to subvert the traditional genre tropes. The elf you play as, Alice, quickly bonds with a fairy companion, Bob. Both names are famous placeholders commonly used in cryptography, and serve to highlight the idea at the game’s core. 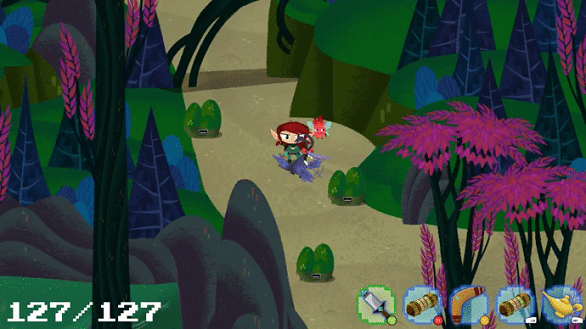 Double Fine has created an environment where exploitation is a viable tactic, where it’s as much about being playful and inventive as it is about solving puzzles. As there aren’t always strict rules to abide by, or a fixed solution to each puzzle, there are often easy ways to conquer barriers and game the system. Hack a raven so that instead of attacking before flying away, it will continually peck at you. Suicidal: except you can also tweak the damage value, so the attacks heal instead of hurting. Increase the attack speed so that the bird’s animation glitches — now you can run around with a mad raven keeping you continually topped up on health. When this fails, simply set the enemy’s health to a negative number and watch their pixels wither. The underlying freedom can be misleading; sometimes you can make the spoon bend, other times you can break the system altogether. The sheer pliability can make enemies easy to outmaneuver, yet puzzles can be more challenging because of this fact. The open and malleable nature of the world obscures the boundaries. Double Fine has intentionally designed a game where parsing those limits and conceptually grasping how different objects interact, often by mistake, is a key to progression. Luckily, to aid the ‘trial and error’ nature of the game, an amulet allows you to travel back in time and space; helpful for when you’ve turned so many different knobs in the hacking process that you’ve broken the puzzle and forgotten the starting variables. Other, more intricate tools, such as the Third Eye Hat, are introduced as the player becomes more comfortable dabbling with the code. These items seem all about bringing unfamiliar elements to the forefront. What once looked like a Zelda-esque action-adventure game slowly turns into the bizarre, info-laden realm of the debugger. 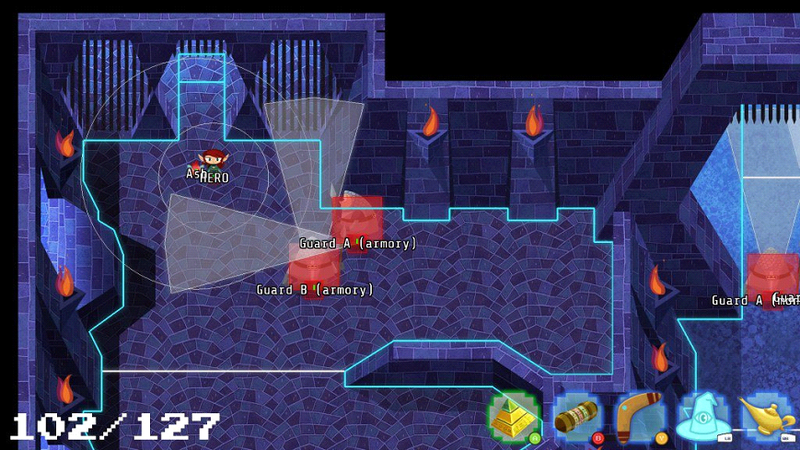 Enemy hit-boxes and cones of vision become apparent, event switches and triggers become visible, terrain collisions are represented showing you where you can and cannot go, and names now appear on objects. Names are important, because they represent values that can be altered in the game. Knowing something’s name appears to be a powerful tool for hackers, cryptographers and imprisoned fairytale damsels alike. Double Fine intends to gradually introduce more complex puzzles and deeper ways to hack the world. Seeing vital bits of information in the game pop out fundamentally changes how you think and solve problems. With the introduction of the Magic Loupe, the game makes another shift in paradigm. The Loupe allows you to dive into pieces of code that represent the functions of items in the world, meaning you can start to change the underlying logic of certain objects and how they operate. 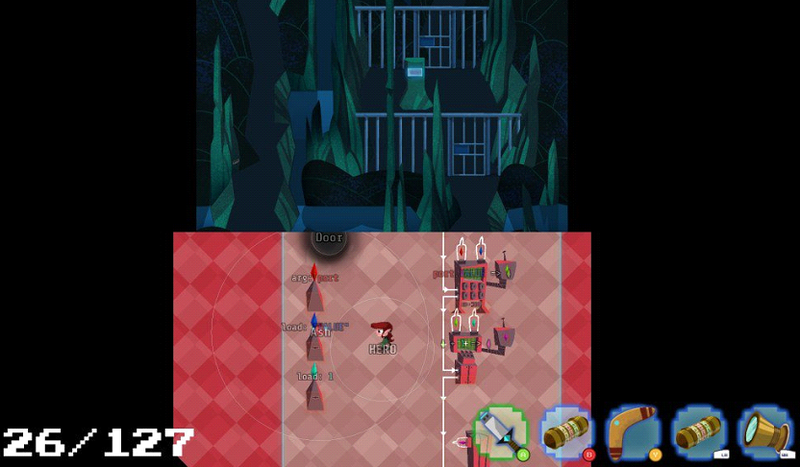 This is where Hack ‘n’ Slash seems to be at its most abstract, with the puzzles becoming thoroughly programmatic as well as lessons in lateral thinking. In a game all about secrets and hidden things, it seems important that Double Fine nails an experimental space beyond just the narrow path of puzzles. Will Hack ‘n’ Slash offer a more replayable experience attached to an open, sandbox-style environment where the different tools can interact, or will there be established patterns for solving each problem, limiting creative choice? Whether all these tools can come together to create an arena of playful choices and decisions, beyond a single, linear path, it’s a little too early to say. However, Project Lead, Brandon Dillion, told us that one of the main Early Access priorities was fleshing out the over-world and “adding additional, harder secondary puzzles”. Brandon also said that, using player feedback to help guide design, they were actively “looking out for the crazy things that players are trying with the game’s tools and feeding those back into the game in the form of new puzzles”. All in all, Double Fine appears to be on to a winning concept. Hack ‘n’ Slash introduces a set of tools that force you to defy the logic of traditional games, to think through problems from a unique perspective, and let you tweak, exploit, and even crash your way through its series of puzzles. Within programming is a form of puzzle solving that is used all the time when developing games, yet rarely when playing them. Double Fine is attempting to solve this imbalance, and unleash a creative side that many gamers might never have considered, let alone have experienced. The current possibilities might not be endless, but seeing the visible limits not only makes for an interesting concept, but also encourages a great deal of inventiveness. Sometimes the experimentation may allow you to move on or cause something unexpected to emerge – other times you may just crash the universe.